Pancreatic Cancer Radiation has begun. I think that subtle glow coming from the east is my mom! Ok, maybe not a humorous subject, but I have to admit, we laugh to keep from crying! I feel like Alice falling down the rabbit hole. The medical technology we have experienced through mom's cancer journey is mind-boggling to say the least. The chemotherapy is at least somewhat familiar. Medicine in, cancer out. But cancer radiation is a particularly alien, medical field. Doesn't radiation cause cancer? Remember Hiroshima?! So, back to the basics. Knowledge is power. Cancer radiation is the medical science of using high energy radiation to kill the cancer cells by damaging their DNA. Once the DNA is damaged, the cancer cells stop dividing and die. But radiation can also damage normal, healthy cells. Obviously, pancreatic cancer radiation therapy must be carefully planned to minimize healthy cell death. Mom's primary oncologist sent her over to the radiation oncologist for this portion of her treatment. Cancer radiation therapy is highly specialized, and we were very fortunate to have Dr. Hernandez, who was not only extremely cancer-savy, but also kind and compassionate. We liked him instantly. Dr. Hernandez chose to use a specialized form of cancer radiation called Intensity Modulated Radiation Therapy, or IMRT for short. The radiation therapy began with a process called mapping. Through various ct scans and x-rays, her pancreatic tumor was "mapped" for the radiation beams. Small, freckle-sized tattoos marked her abdomen for the duration of the treatment. Intensity Modulated Radiation Therapy is just what it sounds like. The intensity of the radiation can be controlled and changed as the beam moves, in order to spare healthy adjoining tissue, and focus increased more precise radiation to the tumor. The radiation beams may be moved dozens to hundreds of times around mom's body and each beam may have a different intensity. This results in a radiation therapy that is uniquely sculpted to mom's tumor. 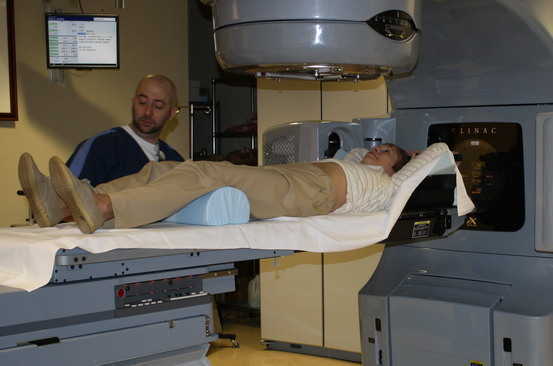 The more conventional radiation therapy is limited by the sensitivity or tolerance of the healthy tissue. And in pancreatic cancer, the surrounding organs that may be affected are the liver, small bowel, kidney and spine. So with IMRT, more radiation will be directed at the tumor, less at the important, healthy organs. Mom's radiation course was 28 days, Monday through Friday, with the weekends off. Each radiation treatment began with a trip back into the bowels of the clinic to the Star Trek-like processor machine. The technician would then have mom lay down on the table and take a series of x-rays to make sure her inner alignment matched their previous mapping. By carefully positioning her in the same way each time, they hoped to minimize the damage to healthy organs and maximize radiation destruction on the tumor. Each session lasted less than 30 minutes. During the treatment, the technician had to leave the room and stay behind a radiation-safe wall. Mom was left alone in the room. With the lights dimmed and a little Nora Jones piped in, she could almost take a nap - except for the fact that she was covered by a $3 million dollar machine zapping her innerds with enough radiation to nuk a small city. Take that, you cancer cells. In addition to the cancer radiation, mom's oncology team decided to maximize the radiation effect by adding a chemotherapy to her treatment. This particular chemo is a companion to the radiation, a radio-sensitizer that makes the radiation more effective. It is called a continuous, low-dose infusion. The name of the chemo drug is Fluorouracil. Or 5-fu for short. The continuous chemo was given through mom's medi-port via a portable pump. It ran, well, continuously. She had a stylish fanny-pack to hold the pump in, so she was fashionably mobile while being tethered to the chemo 24/7! The chemo drug is portioned out to last a week, so mom returned each week for a recheck and a refill. The main side effects that mom had to prepare for during this treatment were fatigue and nausea. To read more about the side effects that mom experienced, click here. The fatigue and nausea usually peak at around 2 weeks into treatment. There was also a chance that the radiation would damage the lining of her stomach. It's hard to miss the stomach with the radiation beams since the pancreas snuggles in so close. Of course, damaging the stomach lining would cause discomfort (read pain) and possibly ulcers. So, to prevent that, Dr. Hernandez prescribed Zofran. Mom took her first dose about an hour before each treatment and continued it throughout radiation. The Zofran did a remarkable job through most of the radiation therapy, keeping the nausea from becoming full-blown vomiting. However, the last 3 radiation treatments really changed the playing field. The doctor told her that these 3 remaining treatments were designed to focus intense blasts of the radiation directly on the pancreatic tumor. Kind of like one final inter-galactic showdown with the cancer cells. He warned mom that the side effects from the radiation may also intensify during this time. And he wasn't kidding. Mom spend the next 2 weeks with her head in the toilet or dragging herself back to bed. She lost over 10lbs, and truly felt like death warmed over. The silver lining to this horrific thunder cloud, was the phenomenal drop in mom's tumor marker results. At the beginning of radiation treatment, mom's tumor marker was 1470 (dangerously high). One month following radiation it had dropped an astounding 1,236 points. The radiation/chemo therapy had brought mom's tumor marker down to 234 (normal is 0-35). We had a hallelujah moment when the results were given to us! Mom decided that the hellish experience was worth the results...But she never wants to go through it again! Which is all well and good, because there is one other note to make about pancreatic cancer radiation. This series of treatments can only be done once. As Dr. Hernandez said, we hit it with all we've got because there's no second chance with radiation on the pancreas. Apparently, the same body parts, or organs, cannot safely be radiated a second time. And in all seriousness, Mom would be the first to tell you that she would probably not survive a second round of radiation. Extremely Effective, but at a Huge Cost! And that's Pancreatic Cancer Radiation 101.